Is Mayweather’s legacy greater than Pacquiao’s? By The Fist and The Furious: The meteoric rise of Floyd Mayweather Jr. and Manny Pacquiao can be chronicled through the similarities and differences in both fighters’ legacies that have spiraled into what we have come to know as boxing’s clash of the titans. After compiling an 84-6 amateur record, Floyd began his ascension to the top of the boxing world by blowing through opponents in the featherweight and lightweight divisions, winning 11 of his first 15 pro fights by TKO. By the time he won his first title in 1999 (at 130 lbs against Genaro Hernandez), Floyd had become a master technician in the ring with KO power. He dominated the Jr. Lightweight division, defending his belt 8 times during a three-year run, dominating Diego Corrales, Carlos Hernandez, and Jesus Chavez along the way. As his name slowly got bigger, he began to realize that becoming the world’s number one pound for pound boxer was his ultimate goal to greatness. Of course, he knew the money would soon follow. Nonetheless, it was becoming more and more evident that someday Oscar Delahoya would soon pass his “golden boy” mantle over to the “pretty boy.” The days of the exciting Iron Mike Tyson had since been long gone, and boxing needed a new hero. As far as Floyd was concerned, he would be it. And so his rise to the top began. Mayweather fought four times at 135 lbs (lightweight), defeating Jose Luis Castillo by UD twice (of course, the first bout was highly controversial and some will adamantly say that Floyd really lost this fight), and dominating Victoriano Sosa and Phillip Ndou, two boxers who weren’t elite prizefighters by any stretch of the means. By the time Floyd had entered the junior welterweight division, his public image slowly began to change and soon thereafter he began to refer to himself as “Money” Mayweather. His fighting style evolved as well. No longer were we seeing the knockouts. Instead he had mastered the art of defensive boxing, a skill that is perfected by very few boxers in the history of the sport. In essence, his offense was his defense, much like Manny Pacquiao’s defense is his offense (but I’ll touch on Pacman later, so hold your horses). After Floyd defeated Sharmba Mitchell in 2005, he was already being considered as the world’s top pound for pound boxer. He went on to defeat the game Zab Judah in 2006, whose mental meltdown in the ring that caused him to lose a winnable fight led to his ultimate self-destruction. By late 2006, Floyd had begun to really cement his name as an elite prizefighter. He went on to capture the WBC and The Ring welterweight titles by defeating Carlos Baldomir, on the way to earning $8 million which was his biggest purse to date. At this time, power punchers Antonio Margarito, the rising star Paul Williams, and Miguel Cotto were also gaining steam in the very tough and competitive welterweight division. It is well known that Mayweather turned down $8 plus million to fight Margarito and the reasons why are up to debate. The only thing we know is that between‘06-‘08 Floyd never took on the elite prizefighters in the division, who all held belts at one time or another. Cotto, Margarito, Williams, and even the 154-lb Mosley could have all been had, for the fame and for the money, and Floyd, for one reason or another, chose not to fight any of them. The popular opinion is that the four aforementioned fighters carried with them a ton of power at 147 lbs. Floyd had only been a welterweight for a year or so, therefore he didn’t want to risk facing aggressive fighters who had the power and chin to withstand anything he brought into the ring. Considering also that Floyd began to have problems with brittle hands, it is all the more understandable why Floyd would hesitate in fighting well-seasoned and grueling welterweights who were bigger than him. Nevertheless, Floyd’s legacy and reputation continued to climb the ladder, simply because of his undefeated record. He knew it was time to make the ultimate payday. And seeing that Oscar Dela Hoya was old, slow, and available in 2007, Floyd made his move. By this time, Floyd was extremely careful to protect his undefeated record (hence his legacy) as well as safeguard his hands, his chin, and his money from complete demolition. Dela Hoya was past his prime in 2007 but he was still game and more importantly, any DLH fight would still gross multi-millions in revenue earnings. Floyd won Dela Hoya’s WBC super welterweight belt by a close split-decision, pocketed $25 million, and retired without giving Dela Hoya a much deserved rematch, without taking on WBA champion Cotto (who held the belt for two years and was arguably the best welterweight in the business at the time and a proven prizefighter), without fighting hard hitting IBF champion Kermit Cintron, without taking on rising WBO champ Paul Williams, and without considering Margarito. Boxing needed a “superhero”, and Floyd was it in 2007. Or so it seemed. Pacquiao, meanwhile, was slowly ascending to unprecedented heights and Floyd was secretly taking notice. Nonetheless, those who have continued to discredit Manny’s growing legacy by claiming he is defeating “shot, old, and weight drained” fighters FAIL to take notice that Floyd, too, has done his major share of cherry picking. Baldomir was 36 years old. De la Hoya was 34 going on 35. Sharmba Mitchell was 35. Shane Mosley was 39. Marquez was 35 going on 36. Gatti was 33 going on 34. These fighters, ladies and gentlemen, were among 6 of Floyd’s last 8 opponents. Hardly impressive indeed, especially when considering that Floyd was supposed to be that “superhero” that saved boxing. Instead, it was the other way around. It was a Filipino, a foreigner, a diminutive figure called Pacman, who made boxing relevant once again because of his charisma, his crossover appeal, and his two flying fists. Since 2008, Mayweather has been in constant battle with his own ego and his own psyche. He has retired and un-retired at least three times. He has gotten himself caught up with several legal battles. His bitterness towards Pacquiao has resulted in a defamation lawsuit against him that can possibly lead to him losing millions of dollars more. His increasing jealousy, envy, ignorance, and perhaps bewilderment towards Pacquiao’s achievements have brought out the worst in Mayweather. So much that Floyd’s antics have grown to the point of utter silliness and brash immaturity – “Take the Test” T-Shirts will soon be sold at your local swap meet. And don’t be surprised if they are made by FRUIT of the Loom. 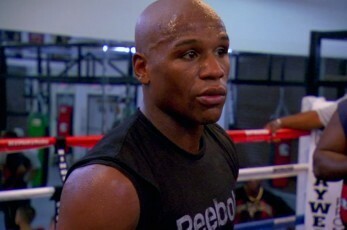 What it boils down to is this: Floyd Joy Mayweather has nothing left to hold onto but his undefeated record. In his discombobulated and out-of-touch reality, the fact that no one has beaten him in the ring is his only safety net in order to justify his greatness and his legacy. Floyd used to take risks and used to put his you-know-what on the line many moons ago when the boxing gods said he needed to earn his stripes and make his name in the game. And then the money got to him. The money got to Pacquiao too. Manny is now regularly drawing well over $1 million PPV with each fight and is grossing a minimum of $20-25 million per fight TWICE A YEAR. But the difference between Pacquiao and Mayweather, in recent years, is that Manny actually loves the sport and is willing to throw it all on the line. And all the experts, insiders, analysts, etc. recognize this and is why Manny gets the nod as Fighter of the Decade. The difference between Floyd and Manny is that when Manny reached the top of the mountain, he was still willing to continue to prove to the world why he should remain on top. Case in point: Pacquiao, year after year, fights twice a year. When Floyd ascended to the top in 2007 he got content, and gone was the motivation and the will to keep proving he was the best. In essence, Pacquiao became the true embodiment of what the face of boxing should be like while Floyd typified the made-for-TV reality show contestant (think, Dancing of the Stars). Not to mention how much more professional, humble, likeable, and classy Pacquiao is than Mayweather. And I have a feeling its eating Floyd up inside each time he sees Pacquiao’s name on the news, the internet, the newspaper, and on SportsCenter. The problem with Floyd Mayweather is that he’s living in the past. What he doesn’t realize is that boxing is passing him by. Meanwhile, Congressman Pacquiao saw the opportunity that Floyd left behind in 2007 and flat-out crept up from underneath him to steal the hearts of fans all over the world but most importantly, the hearts and souls of Americans. Why else would Floyd whine and complain that he doesn’t get enough support from Americans? Why else would Floyd go on a rant about whites vs. blacks on an excusive 9-part interview during the week of the Pacquiao-Mosley fight? Why else would Floyd attempt to prove that he wasn’t scared to fight Pacquiao while thinking the fight was all but a done deal and showed on camera that his trunks, robe, and shoes for the Pac fight had already been made? The answer: Manny became what Floyd always hoped he would become, and Floyd can’t stand the thought of it. It’s as simple as that. Boxing » Floyd Mayweather Jr » Is Mayweather’s legacy greater than Pacquiao’s?